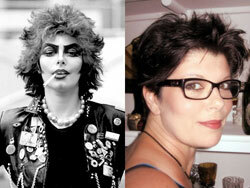 DORI HARTLEY is considered the first FRANK-n-FURTER to perform during the movie. She was part of the legendary group at the WAVERLY Theater in NYC that is responsible for starting audience participation. Even though she has not performed as FRANK in many years, she is still fondly remembered by fans all over the world. She is also a professional artist, whose work reflects her vivid imagination in all things ROCKY HORROR and other things in pop culture. SAL PIRO: Dori, what have you been doing since you retired from performing at ROCKY? DORI HARTLEY: Around the time I stopped doing the floor show, I started getting into some serious theater. I worked at the Public Theater for a while, did a show with Christopher Walken, and after that I focused all of my energy on my musical career as a singer-songwriter. 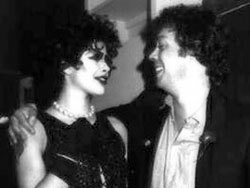 When I asked Tim Curry for advice on to how to proceed with my career choices, he told me to, "Just do it." And this was way before Nike used it as their slogan. I think he was on to something, because I took it to heart and did everything I could and everything I wanted to do. I went from art student to actor to singer-songwriter, even performed a tune on the HBO series, "The Sopranos." In 1998, I gave birth to my beautiful daughter, and three years after that, I was diagnosed with breast cancer. My last public Rocky Horror convention appearance at the Hard Rock in Vegas happened right before my surgery. It was the hardest thing I'd ever gone through, but -- I'm here today! I'm a survivor, going on ten years plus! Today I work as a writer and an illustrator. 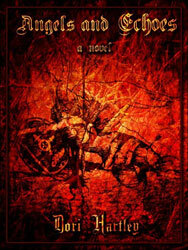 In 2011, my first novel, Angels and Echoes (amzn.com/B005ESFBKC) was published and is available on Amazon's Kindle. SAL PIRO: Are you still in touch with any of the old Waverly / 8th St. Playhouse group? DORI HARTLEY: Well, thanks to the magic of Facebook, I'm in touch with everyone! I mean it. It's quite amazing, actually -- the way Facebook brought everyone into everyone else's vision, once again. I'm in touch with so many great old friends, and have been able to meet many of the folks who I never got a real chance to talk with, back in the day. There are people who haven't surfaced, however and I wonder whatever happened to them. We were such a bunch of characters back then. Everyone was so memorable. SAL PIRO: What was it like working with Tim Curry and appearing in his video for PARADISE GARAGE? DORI HARTLEY: It was a dream come true. At that point, you couldn't have given me a more heavenly experience. He called me up, asked me if I wanted to make an appearance in his video -- as Frank -- and a few days later, he asked me to just hang out for the shooting of I DO THE ROCK. I loved Tim, and I was so fortunate to be friends with him. We spent a lot of time together during the time he lived in the village. He was always so good to me. He was the first person to turn me on to sushi. I think I got under his skin, in a way -- like, he couldn't say no to me, because I was so -- into him, yknow? By the time he asked me to be in the video, we had already shared many great, great times together. And we did some crazy drinking together, too -- wow, can that guy handle his booze! I couldn't, but then again, I was like... 18? What did he like to drink? The finest champagne with Pear William brandy. SAL PIRO: I hear that Tim is a big fan of your artwork and you almost did the cover portrait for his second album? DORI HARTLEY: A long time ago, Tim said that he thought I was the best illustrator he'd ever seen, which was ridiculously complimentary! I was thrilled, but I do wish he could see my stuff now -- it's so much better than what I was able to do then. Then again, I did hundreds of drawings of him, some of which he keeps in his home today. I certainly did try to get the cover, but record company politics is just that. It would have been nice, but at the time, I think people really wanted to see a photo, more than artwork. So, I saved the art for myself, and for Tim. SAL PIRO: What is your favorite ROCKY HORROR memory? DORI HARTLEY: Wow, there are just so many, and all of them priceless. I mean, how could I ever forget the day YOU - Sal - handed me that bag of authentic costumes, straight from the Belasco production? Definitely one of the best memories. Then, the day Sue Blane gave me the dinner shirt -- whoa, that blew my mind! The dinner shirt, yet! I will always remember that first walk I took, the day I dressed up for the first time. No one had done anything like that before and I was lost in this buzzed-out Frank-trance -- I could have walked into a car, right there in front of the Waverly, but somehow, I found myself, in full costume, walking alongside the line of people waiting to get tickets. Everyone's mouth dropped open, and they bust into this big applause. HOLY MOLY, that was IT. Nothing was ever the same, ever again. I went from regular ol' art student to Greenwich Village cult of personality! I also fondly remember standing precariously placed on the small ledge of the upper balcony, at the Waverly, looking over the crowd, balanced on about one foot of ledge. Then, my brother pointed a high beam flashlight up at me, and the whole audience looked up and screamed. Remember, this was never done before. People weren't familiar with this kind of thing happening in theaters. The word, "floorshow" didn't even exist at that point. But, there I was, and there you were, Sal... and we saw it all happen. All that magic, right before our very eyes. SAL PIRO: How did Rocky Horror affect your life? DORI HARTLEY: Rocky enabled me to be a free spirit, which worked to both my benefit and my detriment. I really did live in the mindset of "Don't dream it, be it," and for many years I manifested my dreams again and again. On the other hand, I was so confident that these dreams could always come true, that I didn't prepare a "Plan B" in the event that my luck might run out -- which it did. Nonetheless, my experience in Rocky Horror set the tone for my entire life. Being thrust into the spotlight at such a young age gave me a lot of confidence, especially with public speaking and appearances. At a very early age, I was at the center of attention, and though it seems like a fun place to be, it's not always an easy place to be. So, I learned from it. I learned how to deal with large groups of people as well as their perceptions of me, whether good or bad. In the long run, Rocky Horror taught me to strive to make my dreams come true. And, in a way, Rocky Horror will never let me go, which is fine because I like the association. It's been decades that I've gone through life being known as 'the first Frank' -- hey, I love it. Who knew we'd make history? Not I. But I did know that from the very first time I flounced down that aisle at the Waverly -- life would never again be the same. SAL PIRO: Presently what do you do about the art? do you sell prints? would you do private commissions? DORI HARTLEY: I do art 24-7. I sell prints of my art, and I do commissions for private clientele. What I create are digital illustrations. My specialty is portraiture.